The patient was a 71 year-old male with a history of smoking. 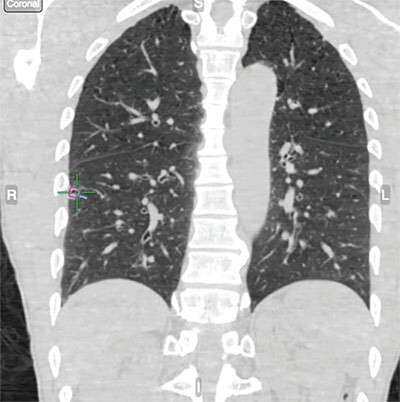 Due to his lengthy smoking history and other contributing high-risk factors, the patient was advised to get a chest CT. 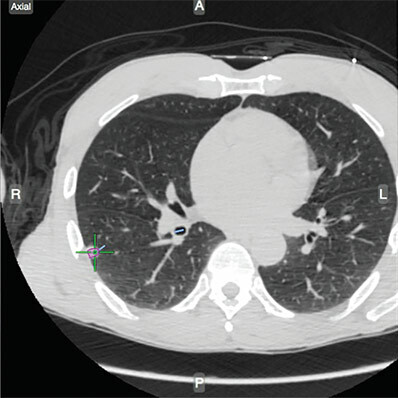 The CT revealed a 14mm Ground-Glass Opacity (GGO) nodule in the Right Middle Lobe (RML). The pleural based nodule was located in the RML without a direct bronchus sign. A sphere was placed on the GGO nodule marking where the biopsy would take place. The nodule was also sitting on a fissure, so precision was crucial. Veran’s Inspiration/Expiration CT Scan Protocol revealed 3cm1 of movement, over twice the nodule’s diameter. 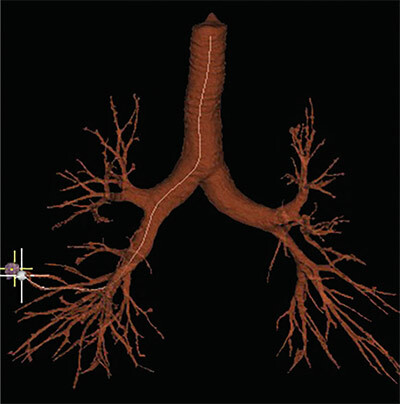 A plan was created to biopsy the nodule endobronchially. Due to the location and lack of bronchus sign, the decision was made to biopsy the lesion endobronchially with the possibility to convert to SPiN Perc™; therefore a second plan was created. Navigation began with a main carina verification using the Always-On Tip Tracked® forceps. With ease, the nodule was reached within 2 minutes. 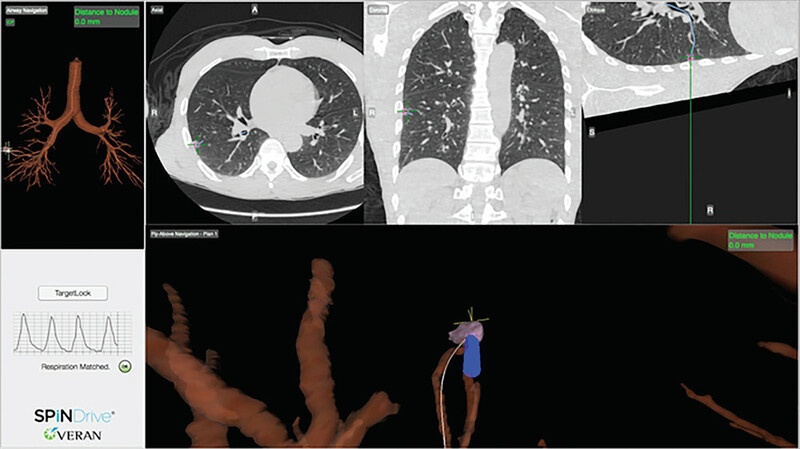 Due to 3cm of nodule movement, it was imperative to monitor the respiration of the patient. The respiratory gating on the system ensured the tissue was diagnostic, without the need for fluoroscopy. Pathology reports showed Adenocarcinoma. The patient underwent a RML lobectomy.